Being one of the most common sleeping disorders1, you’ve probably heard enough whispers about sleep apnea to build a mountain as big as Aoraki. With so much misinformation out there, we’ve decided to set the record straight by busting the top five sleep apnea myths. When someone has a higher than normal BMI, their throat and tongue muscles are generally more relaxed when they sleep, which can cause the airway to become blocked. But while weight might be a contributing factor to sleep apnea in some cases, it doesn’t always mean that if you’re overweight you’ll experience sleep apnea. Even fit people aren’t immune to the sleeping condition! A key cause of the problem has to do with your neck size and how narrow your airway is. Even the structures of your jaw, tongue, tonsils and palate can have a direct effect on this, regardless of your clothes size. Other factors aside from weight can be associated with sleep apnea in adults, such as diabetes2. It’s believed that sleep apnea affects about 95,000 adults in New Zealand, with almost 80 per cent of New Zealanders not receiving treatment for the condition3. While there are strong links between snoring and sleep apnea, it isn’t automatically a cause for self-diagnosis. However, you shouldn’t dismiss snoring altogether. Quite often people can put snoring down to ageing, but don’t accept snoring as a natural part of life4. 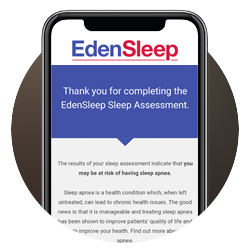 The best way to explore whether sleep apnea is a possibility is to take an online sleep assessment, which is available directly through our website. 3. The more I sleep, the better I feel! Have you ever slept for a long time – perhaps even longer than eight hours – only to wake up feeling surprisingly tired? While you might think that you’ll feel more refreshed by oversleeping, research indicates otherwise. Experts suggest that adults should typically clock up between seven and nine hours sleep each night. Getting too much shut-eye has even been linked to a host of medical problems, including diabetes and heart disease5! The key is getting a healthy balance of sleep. The moral of the story? More sleep is not always the solution to your sleeping problem. Unfortunately, that’s not true. Sleep apnea can actually affect up to 3 per cent of children6. The most common cause of snoring and sleep apnea in children is larger than normal tonsils and adenoids, however weight can also be a factor7. If your child snores, take note. A child with sleep apnea usually snores loudly on a regular basis, takes pauses, gasps and snorts throughout their sleep and can be found restless or sleeping in an abnormal position8. If your child fits this criteria, complete our online sleep assessment as a first step. If you’re diagnosed with sleep apnea, you can be assured that there are many ways to find a solution to your sleeping problem. The most common sleep apnea treatment is Continuous Positive Airway Pressure (CPAP) therapy, which is known as the ‘golden standard’ of sleep apnea treatment. CPAP masks come in all shapes and sizes for comfortability. And we offer CPAP trials to help see if it’s the right treatment for you. Besides, you’ll be in the good books with your bedtime partner if you’re able to find a solution to your sleeping problem and give them a silent night! Consider the myths busted! How can I learn more? Now that you’ve got the facts and the top five sleep apnea myths have been busted, ensure you explore the full benefits of effective sleep, health and nutrition by downloading EdenSleep’s free eBook, ‘The Three Pillars of Health’.